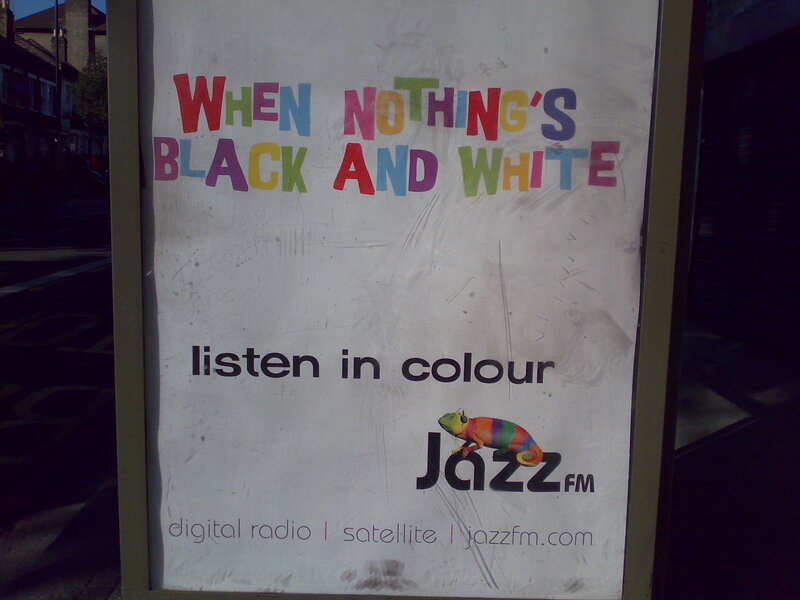 I’ve found this fascinating advert on a bus stop this morning: Jazz-FM are either back, or this is a really really old one. They’ve even got the chameleon logo going again. The station started as a Jazz station in the early nineties, together with Classic-FM. At first they played proper Jazz, which was deemed too unpopular, so they’ve changed their line-up to something more smooth. It went so far that they were to change their name to J-FM. It didn’t happen at the time, but a few years ago instead, when they became Smooth-FM, and now they’re called Smooth Radio. I think Chris Tarrant is on it at times. Another (related) glimmer of hope was a DAB station called The Jazz (on www.thejazz.com), playing hard Jazz, but they’re ancient history now. Glad Birdsong Radio is still going strong though. We scanned the DAB spectrum immediately, and sure enough, http://www.jazzfm.com are back on the air waves! I’m glad to have Helen Mayhew and Sarah Ward back for some Dinner Jazz in the evening, annoying litte P.Y. in the afternoon and the likes of Mike Chadwick in the night– although from midnight you’re not sure if you’ve tuned into Chill or Jazz FM. Nothing has changed then– I’m glad to hear it! Just to give you the bad news…Birdsong Radio has been taken off the air.